NPR went to Grimey’s to talk about Taylor Swift, Kenny Chesney and Zac Brown Band. If that confuses you, you probably weren’t one of the four people who went to Grimey’s to purchase T-Sweezy’s new album Speak Now on release day. So we know that somewhere out there, people are paying for country records. Turns out they’re even doing so in Nashville. 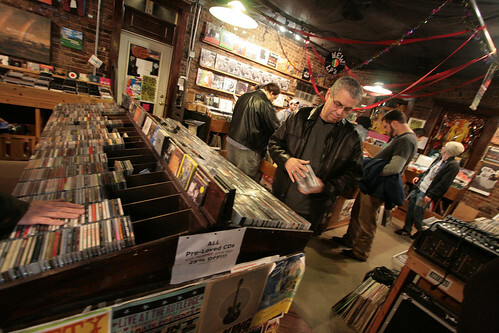 Davis says that at Grimey’s, a decade-old indie-focused store just around the corner from Music Row near downtown Nashville, he’s seen an uptick in customer interest for mainstream country releases. “I sold a grand total of one of that last Taylor Swift CD,” Davis says, speaking of Fearless, the best-selling album of 2009. He says that in its first day on sale last week, Grimey’s customers picked up four copies of Speak Now.